At Swan Mountain Snowmobiling, we aim to be Glacier Country’s premier snowmobile outfitter by offering a variety of special snowmobile tours to keep the experience fresh. Just because you are short on time doesn’t mean you have to skimp on a great experience! We have plenty of options for Flathead Valley snowmobiling. Our 2 hour “Quickie” tours take you to a picturesque location treating you to the best views around! From the top of Desert Mountain, you’ll have a jaw dropping 360 degree view covering Glacier National Park, Badrock Canyon and the Great Bear Wilderness. From the top of Crane Mountain, you’ll enjoy stunning views of the Swan and Mission Mountains as well as Flathead Lake. Canyon Creek offers panoramic views of the Canadian Rockies, Flathead Valley and Whitefish Lake. These tours are the only ones of their kind in Glacier Country and an absolutely perfect solution for groups looking to squeeze an amazing two hour snowmobile experience into their winter vacation. The most recent addition to our snowmobile offerings is truly one-of-a-kind! It’s officially the longest continuous guided tour in Glacier Country, starting North of Columbia Falls and ending in Olney, (Northwest of Whitefish). This full day guided tour connects two different forest systems (Flathead National Forest and Stillwater State Forest) for double the scenery! The journey begins with an 8:15 a.m. check in at the Canyon Creek trailhead. As we traverse up the mountain you’ll take in majestic views of the Canadian Rockies, Flathead Valley and Glacier National Park. By the time you’ve reached the Summit of Whitefish Mountain Resort on Big Mountain, you’ll have worked up an appetite so we’ll grab a hot lunch and warm up at the Summit House. For the second half of the day, we will take in a view at Werner Peak Lookout and then make our way through the Stillwater State Forest with its picturesque vistas of the Flathead Valley and Whitefish Lake. We’ll conclude our trip just as the sun starts to set around 5:00 p.m. This tour is only offered as a guided tour and requires a minimum of 2 sleds. There’s something remarkably thrilling about whipping past snow dusted trees and frozen lakes. What makes our Sunset Snowmobile Tour that much more spectacular is the opportunity to watch the sky paint and re-paint itself over vast stretches of land completely covered in a pristine blanket of snow. Take in the beauty and wonder of a Montana sunset as you hot cocoa and tasty snacks atop a rocky mountain ridge top. The check in for the Sunset Snowmobile Tour is two hours before sunset and you should plan to be with us for two to three hours. Many folks are new the sport of snowmobiling, and it has been many years since they “straddled a sled”. We offer refresher courses and instruction clinics either as a separate activity or as a part of any of our guided trips. Be sure to tell our friendly reservation staff your interest in additional instruction, and we would be happy to custom design a program for you and your family or group. Be sure to mention your interest in these programs so we can customize your snowmobile tour. At Swan Mountain Snowmobiling, we get a kick out of providing unique vacation experiences for our guests. 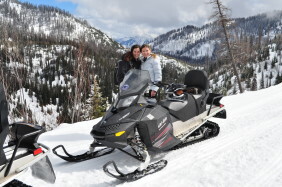 If you and your group have an idea about something you’d like to do, give us a call and we’ll be more than happy to work with you to customize the perfect Montana snowmobile tour for your group or family. Snowmobiling is one of the easiest motorized recreational activities to learn. Today’s snowmobiles are designed with a variety of comfort and convenience features that make it safe and enjoyable to ride for several hours. Additionally, longer snowmobiles which are ideal for two people to ride at a time, are becoming more and more popular every year. For detailed information on our snowmobiles visit our sled overview page. 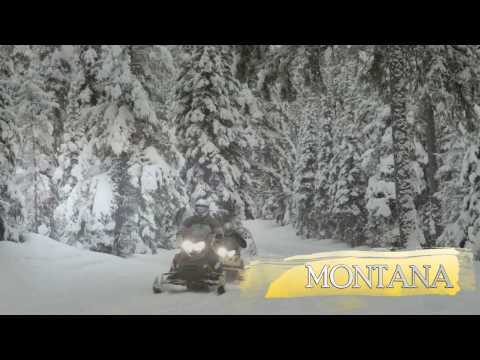 This means that individuals of all ages are able to participate in this thrilling winter sport, making a family snowmobiling trip an essential part of an ideal Montana family vacation. In a recent article, SKI magazine noted that more families are doing more activities than just skiing during their winter vacations. As a result, the best winter vacation destinations are those that enable families and groups to participate in a greater number of activities. The Flathead Valley is a winter recreation wonderland and the ideal destination for a family vacation in Montana. The valley boasts over 200 miles of groomed snowmobile trails, with nearly 2,000 miles of U.S.D.A. Forest Service roads that take you into great hill climbing, powder play areas, wildlife viewing and spectacular ridgetop views of Glacier National Park, the Canadian Rockies, the Swan and Mission Mountain Ranges and Flathead Lake. Add to that more than 4,000 acres of skiing at the Big Mountain Ski and Summer Resort, ample cross-country skiing, ice fishing, ice skating, dog sledding, bladerunning, snowshoeing, sledding/tobogganing, and sleigh rides and you have a true winter playground that everyone in the family can enjoy. At Swan Mountain Snowmobiling, we want to make your Montana family vacation a safe and enjoyable experience that will produce cherished memories to last a lifetime. We encourage all prospective riders to take a moment and read our client testimonials. Find out why Swan Mountain Snowmobiling is your best choice for family snowmobile tours!